On Thursday, March 21, in the midst of Kentucky’s deliberation over allowing votes to be cast over the Internet, the daily poll of the Louisville Courier-Journal asked the readers, “Should overseas military personnel be allowed to vote via the Internet?” This happened the day before their editorial rightly argued against Internet voting at this time. 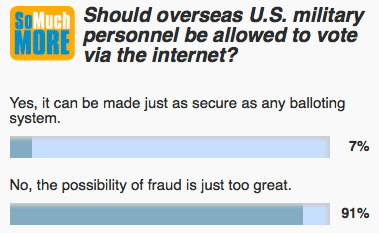 One of the multiple choice answers was “Yes, it can be made just as secure as any balloting system.” This brings up the old adage, “we are all entitled to our own opinions, but we are not entitled to our own facts.” The simple fact is that Internet voting is possible – but it is definitely NOT as secure as some other balloting systems. This is not a matter of opinion, but a matter of fact. Votes cast over the Internet are easily subject to corruption in a number of different ways. To illustrate this point, two colleagues, both former students, wrote simple software scripts that allowed us to vote multiple times in the paper’s opinion poll. We could have done this with repeated mouse clicks on the website, but the scripts allowed us to do it automatically, and by night’s end we had voted 60,000 times. The poll vendor’s website claims that it blocks repeated voting, but that claim is clearly not entirely true. We did not break in to change the totals. We did not breach the security of the Courier-Journal’s computers. We simply used programs instead of mouse clicks to vote on the poll website itself.